What’s that famous quote? Ah, yes. People’s preferences change all the time. You can’t anticipate this, so often you must simply go with it and design an experience that is flexible enough to account for the changing winds. of the experience you deliver. 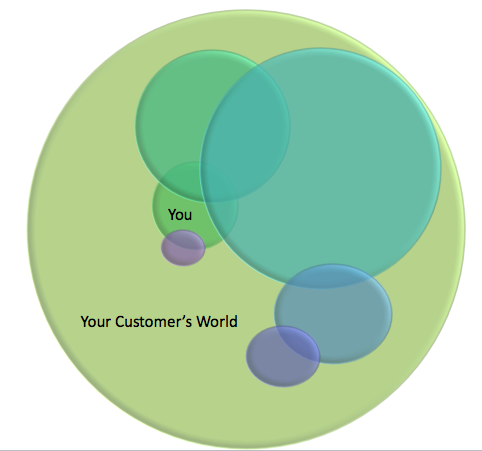 Your products and services likely interact with a lot of other products and services in your customer’s world. The permutations of this are infinite. You can get a good idea of the most common match-ups, but you probably won’t be able to understand the entire universe of tools your customers use in addition to yours to get their jobs done. All of your research on “what your customers want” is most likely a slice of the actual population. You hope it’s statistically relevant, and should be safe in that assumption if you segmented appropriately. This should be noted as a potential reason for missing the experience mark, however. As well, if your research was completed more than six months ago, you may be out-of-date. Even with all of the unknowns, you can and should still work to exceed your customers’ expectations. There are a few critical foundational stakes that need to be put into the ground before you even begin your work. If you don’t accomplish this before you start implementing your program, your chances for success are slim. Set Expectations Upfront. Get Executive buy-in that this is a continual work-in-progress. There are a few pieces to the buy-in. Budget needs to be persistent. Time needs to be accounted for – nothing will happen overnight. They need to agree to at least a year (I’ve seen up to 5 year plans) of incremental improvement that adds up to a lot over time. The leadership team needs to agree to evangelize on behalf of the Customer Experience effort regularly. Keeping the purpose top of mind is critical to keeping the company on track. Measurement. Get agreement across the company on how you are going to measure success. I will be writing a dedicated post on this as a part of this series (See Customer Experience Truth #6), but know that it will require your having done a bit of research upfront. What metrics can you get a hold of weekly, monthly, and quarterly? Who will you need to rely on to obtain these metrics? Are they allies, or do you need to do some work there to get on their radar? Find Early Advocates. You will want to know who your go-to advocates are throughout the company. Make sure you have at least one in each of the key teams, including Support, Product, Marketing, and IT/GIS. Same as with the Executives agreeing to evangelize for you, advocates will need to do the same for your customers. See the pattern here? From top to bottom, your company should have a network of advocates who are there as the foundation for your customer. They are the ones who will be there at the right time and place to represent your customer’s collective voice when key decisions are being made. This is the early framework for addressing Customer Experience Truth #12 (employees are also your (you, not your company) customers in the world of Customer Experience). Next, we’ll talk about Customer Experience Truth #2 – Customer Experience cannot be successful as a siloed effort. This post is 2 of 16 in a Series on CXP Fundamentals. Read more about CXP Bootcamp here. Thanks for the comment, marketini – really appreciate it! Agreed, any single group attempting to control the experience as opposed to collaborate with peers as well as customers will find it extremely challenging to be successful in the customer’s eyes… which is what really matters! This is a very insightful post. It supports the need for marketers to align customer expectations and customer perceptions of service/ product use. So often, marketers approach this with intent to control marketing communications and manage the customer’s experience. The truth is that the service is only a small part of the customer’s interests, activities and life. This article drives that home and opened my eyes. I’ll be following the CXP boot camp series.